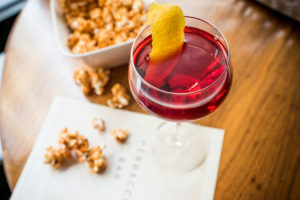 To celebrate Negroni Week, June 6-12, Perbacco will be serving their popular Negroni Caramel Corn with gin-spiced sea salt and four special cocktails. Chef Staffan uses the classic Negroni cocktail to enhance his caramel popcorn, coating the exploded kernels with a caramel made with Campari and sweet vermouth. In place of the gin, he uses a salt with botanicals found in the spirit like juniper, coriander seed, cardamom and licorice root. For Negroni Week we will be serving four special cocktails and $1 of every cocktail sold will be donated to Meals on Wheels San Francisco.